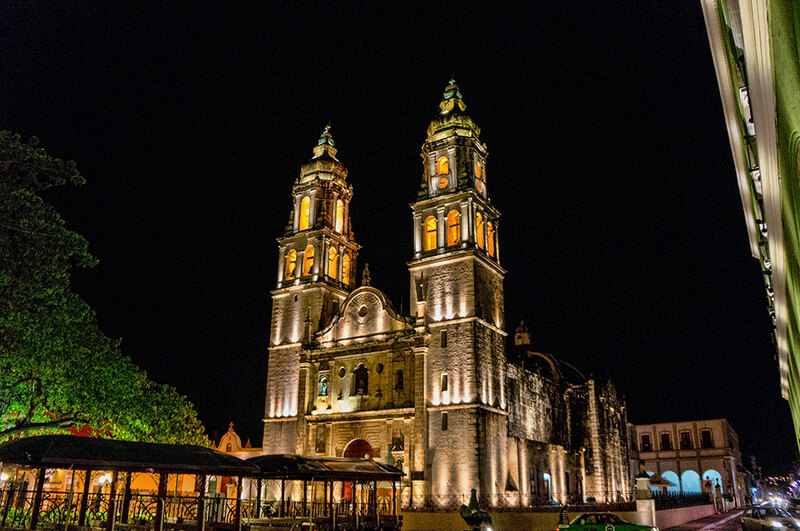 The city of Campeche is a historic colonial town, a UNESCO world heritage site filled with quaint buildings and shops. Campeche, located on the Gulf of Mexico was founded in the 16th century by Spanish conquerors. After the discovery of a precious dye found in nearby trees it quickly became a city of wealth and prosperity. 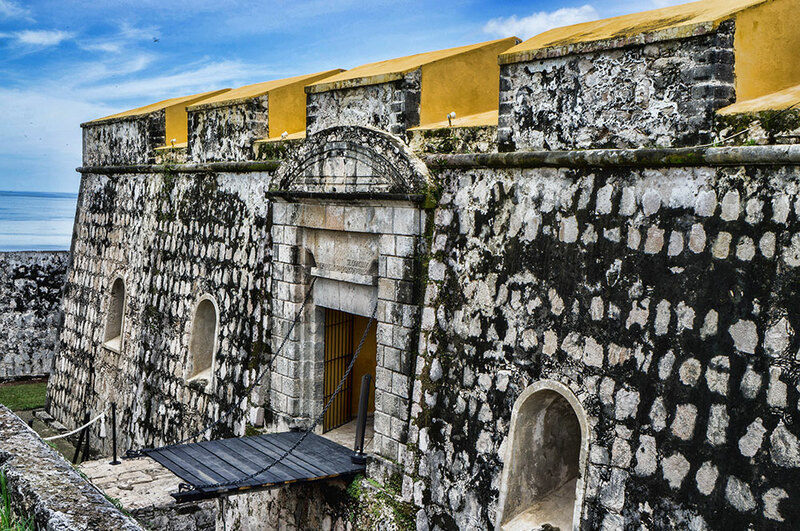 After years of pirate attacks and looting the city was enclosed on all sides by a large rampart (defensive wall) with forts and bastions scattered about, making it one of the most unique cities in Mexico. Although it’s history has been well preserved there is a mixture of both old fashioned and modern culture blending together here. Unlike other touristy cities I’d visited there was almost no English spoken or understood anywhere in the city, restaurants and hotels included. During the 3 days I was here I only bumped into one other English speaker, a fellow U.S. citizen – everyone else, tourists included, appeared to be from Mexico. 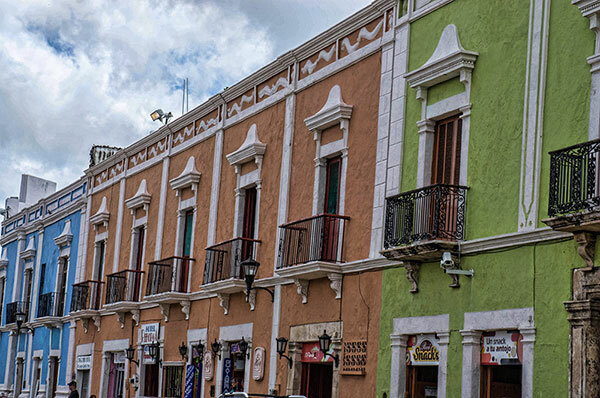 Coming here from the international destination of Playa Del Carmen was quite an enjoyable (and sometimes frustrating) experience. 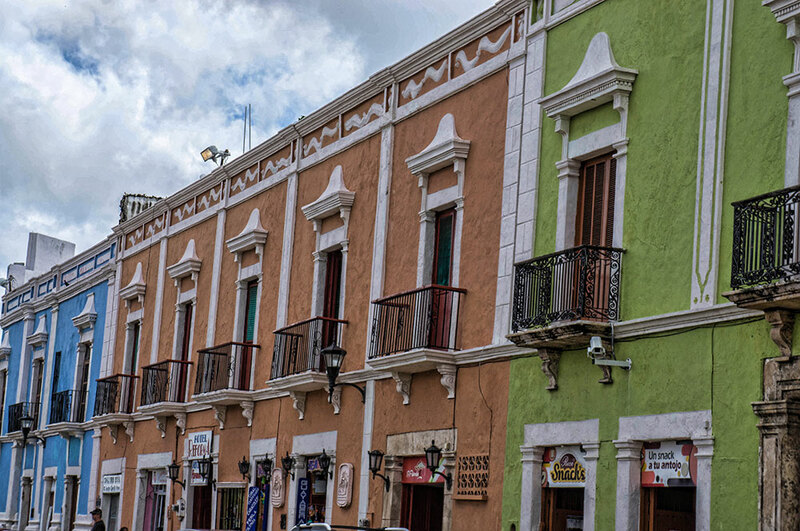 Campeche was the first of many colonial cities I plan to visit – and it felt magical walking down the worn out streets observing the charming and colorful buildings. The old city square lights up and is just as beautiful after dark as it is during the day. Traveling alone in a new place I always wonder how safe the streets are at night. I wandered around Campeche for hours after the sun had set and never once felt unsafe or threatened (like many cities I visited in Mexico). 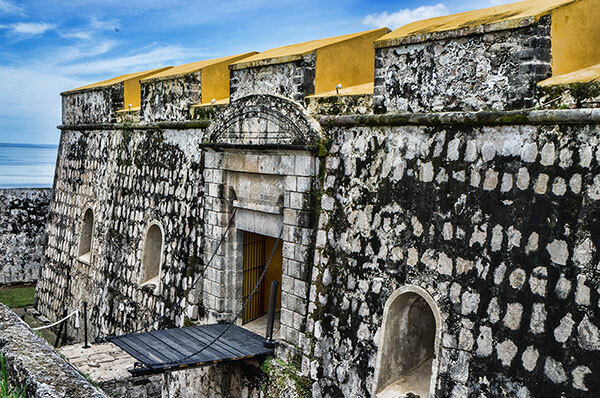 Campeche’s claim to fame and main tourist attractions are the old forts and bastions. 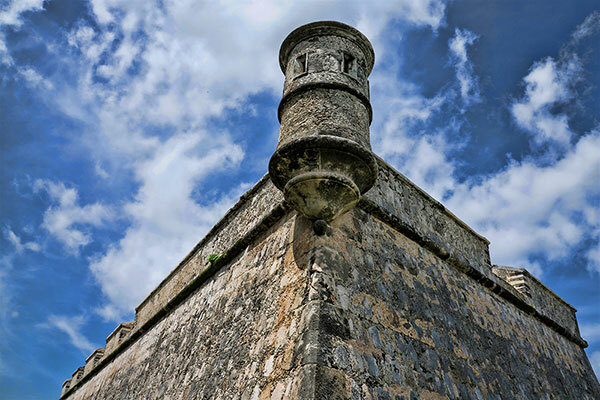 Many of them are small and easy to walk to from inside the walls of the old city. However, the two most beautiful and interesting are a good distance away from the city center. I walked to Fort San Jose, it took about an hour and included a very steep hills in the sweltering heat. Laying eyes upon the front of this fortress however made the long, sweaty trek completely worth it! The contrast of it’s yellow rooftop, gray stone walls and the bright green grass are a sight to behold. 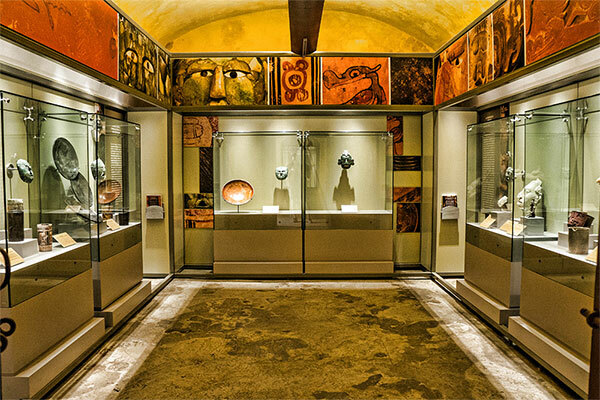 Once inside there is a modern museum filled with artifacts from the Mayan world which were unique and interesting on their own. Up a few stairs I find myself on the roof, with incredible views of the city below and the gulf of Mexico to the other side. I can’t help but imagine how it must of been to keep guard here all those years ago. 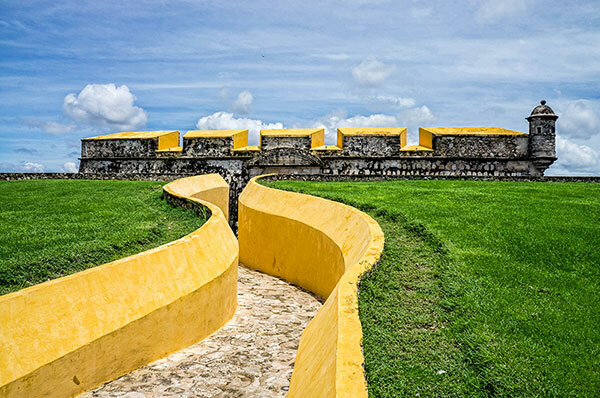 Located on the opposite side of the city I next visited Fort San Miguel – I wouldn’t advise trying to walk to both in a single day, especially when it’s hot out. I took a 15 minute taxi ride for a few dollars. 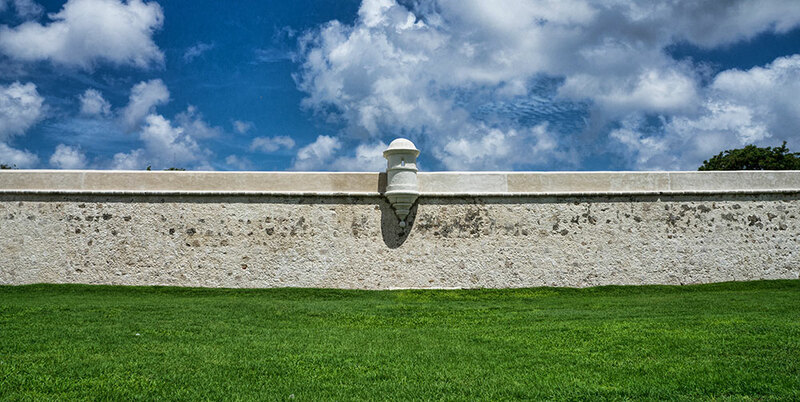 Located atop another steep hill, Miguel is bigger, yet lacking the color of Fort San Jose. Walking across the drawbridge I again can’t help but be enveloped by my surroundings. Like the previous one this fort’s courtyard held rooms along the walls, inside of which were museum artifacts from the Mayans. Up top, the roof was lined with cannons and great views of the ocean. If it weren’t for the heat it would be a great place to relax as the hours pass by. 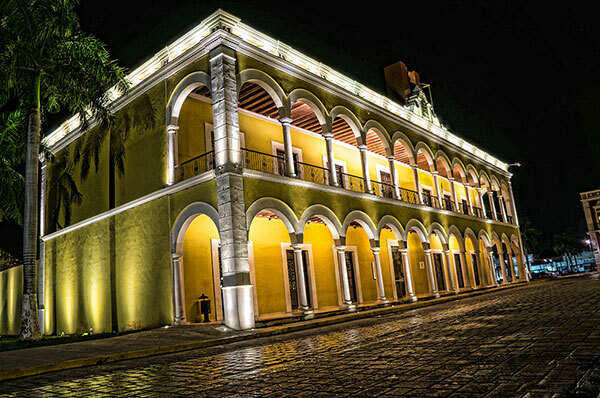 I really enjoyed all of the pictures, but my favourite snapshots are these taken in Campeche at night. Man, I need to admit that this place looks awesome! Wow! Gorgeous. I love your San Jose shots with that vibrant yellow! 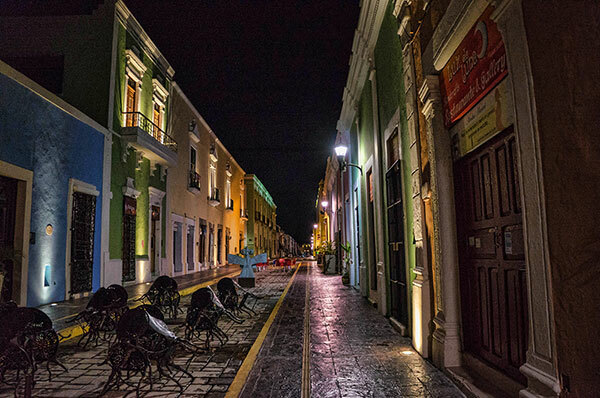 I’ll have to put Campeche on my ever-growing list! I’m mexican and never been in Campeche! Thanks for sharing this to the world. Now we can better see how Campeche is and what it’s all about! Beautiful photographs of a wonderful city with a rich history. Thanks for sharing!